Siri and Erik are sister and brother, the children of a Danish widow whose family was left in dire financial circumstances by the death of her potter husband and his partner's mismanagement of funds. To continue to provide for her family, the children's mother moves them into Gravsted, a home built near a Viking burial ground. The locals are very superstitious about Gravsted, and many warn Siri and Erik that their days of living there will be numbered because a ghost will eventually drive them off of the property. Their mother is undaunted, however, and they try to be as well, finding hope in the luck that is said to be brought to their home by the fact that storks have laid a nest across its chimney. Over many months Erik and Siri see their share of hardships, but by remaining true to themselves and never being afraid to work hard, they and their mother ultimately overcome all the adversity they have faced since the death of their father. There is no question that this book is old, and that it promotes, or at least mentions, some ways of thinking that are utterly offensive to our contemporary way of thinking. First, there is the mother's outright suggestion that not all lives have equal value. She tells Siri and Erik that "in Viking times people were not allowed to marry unless they had enough property to feed themselves and a family. Now anyone may marry, criminals, half-wits, and paupers." This struck me a shocking thing to say in a children's book, and I had to wonder how it was received by readers of the time. The other instance that caught my attention is when the mother states that slavery is not always associated with cruelty. She was not necessarily incorrectly in describing the way some slaves were treated by gentler owners, but it's foolish to suggest that simply owning someone in itself is not cruel. These passages aside, however (and I do think it is possible to put them aside and enjoy the book) this book has an uplifting message about the benefits of doing what is good and right even in the face of many others who do much wrong and much evil. Siri and Erik face a lot of disappointments in the story, but with their mother's guidance, they meet each one head-on. They take responsibility sometimes even when they are not blame, and each time they humbly accept the consequences of such actions, their honesty and humility lead to a reward greater than they could have imagined. Contemporary books are concerned with many things - breaking apart gender norms, promoting diversity, encouraging girls to study science, empowering kids to stand up to adults - but it's been a long while since I've read a children's book that teaches kids to obey their elders and follow the rules and then explicitly shows the rewards that come from such behavior. I found it completely refreshing. Along with the excellent message, the story also offers a compelling mystery along the lines of No Boats on Bannermere and The House of Dies Drear. The mystery plot is well-structured and kept me guessing right up until the end. There is also a great surprise moment near the end of the book that brings the story full circle in a way I never expected. Sticks Across the Chimney was a completely new discovery for me, handed to me by my husband with high praise and an assignment to read it immediately. I could not have been more pleasantly surprised by how much I enjoyed this book. 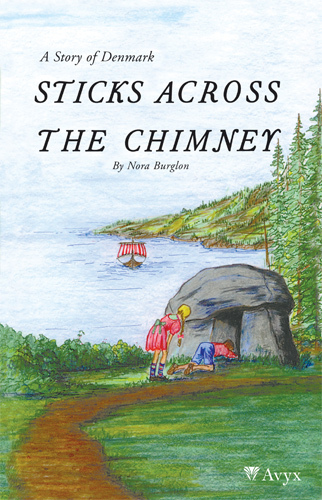 It's a great read-alike for The Wheel on the School (but better) and a wonderful history lesson about Vikings as well as daily living in early 20th century Denmark.